Vanity Fair put out an outstanding article where they interviewed George Lucas, Harrison Ford, and Steven Spielberg about the new movie to come out "Indiana Jones and the Kingdom of the Crystal Skull" to be released May 22. In the article they give us a nice look at what we can expect from the next Indiana Jones installment. The article also included some cool new pictures. The film was shot at several locations: New Mexico, New Haven Connecticut, Fresno California, Hawaii, and in the Studio. Some other things we know about the film is that it is set 20 years latter in 1957 during the Cold War where Dr. Jones is against the Cold War Russians. Karen Allen returns in her role as Marion Ravenwood who was Indy's love interest from Raiders of the Lost Ark. Shia LaBeouf's also has a role in the movie which is not known yet but is suspected to be as Indy's and Mrs. Ravanwood's child but that rumor is not confirmed. As vanity fair puts it "Rising star Shia LaBeouf joins the cast in a role that no one connected with the film will confirm is the love child of Indy and Marion"
The Seed (MacGuffin) for the idea that would drive the story was first realized while shooting and working on the young indiana jones series. 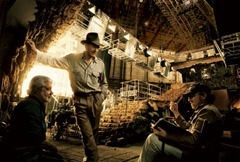 Lucas said "...I was doing Young Indiana Jones, and I was actually with Harrison, shooting a little piece for it, and I was up in Wyoming, where he lives, and I came up with this MacGuffin..."
Ford and Spielberg did not like the original idea but Lucas wasn't going to give up. Over the years he kept pushing it and after going back and forth for a while they came to a script that all parties were happy with. 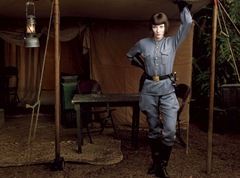 The inspirational source for the Crystal Skull will come from the 50's B movie classics. As Lucas said "...So instead of doing a 30s Republic serial, we’re doing a B science-fiction movie from the 50s. The ones I’m talking about are, like, The Creature from the Black Lagoon, The Blob, The Thing. So by putting it in that context, it gave me a way of approaching the whole thing.” This should mean that the Skull would be of alien or monster origin but we will have to wait till May 22nd to find out for certain.